What is Artificial Intelligence all about and how will it impact the role of a Business Analyst in the future? How do we prepare for a world "ruled" by machines? Artificial Intelligence is quickly becoming ubiquitous even as more industries begin to look for opportunities to influence human capital, operational costs, company revenues and customer experience via AI applications. The availability of big data and tremendous computing power (at reasonable cost) have expedited the adoption of machine learning to build much more intelligent systems that can learn from data. We explore the history of Artificial Intelligence in this presentation and "attempt" to paint a future where intelligent machines are more dominant across all sectors. The goal is to facilitate a discussion around what the Business Analysis profession will look like in a future that is "ruled by machines". The Sprott School of Business at Carleton University explores complex management issues through innovative programs, interdisciplinary research and collaborative partnerships. Sprott offers business degree programs at the undergraduate, master’s and doctoral levels, as well as a range of professional development programs. Sprott's Masters Certificate in Business Analysis equips you with the knowledge and techniques necessary to be an effective Business Analyst and, most importantly, helps you become a professional BA, able to achieve successful business solutions and satisfy customers. The Sprott School of Business is accredited by The Association to Advance Collegiate Schools of Business (AACSB). The Masters Certificate in Business Analysis is offered in partnership with the Schulich Executive Education Centre at York University. 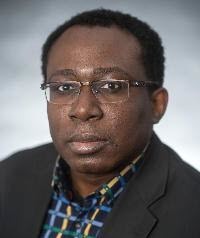 About the presenter: Patrick Egbunonu is an Artificial Intelligence and Data Analytics Applied Researcher, Entrepreneur and Professor. He’s held leadership roles in the Financial, Energy, Consulting, Automobile and Data Science Industry. Most recently he was the Manager of Group Underwriting, New Business, Amendments and Analysis at one of the top Insurance Companies in Canada. Patrick is currently the CEO of 1001Squared Artificial Intelligence, a social enterprise he founded in 2017. 1001Squared AI’s goal is to facilitate and advance the use of Artificial Intelligence applications to enhance education, especially in underprivileged and under-served areas of the world. Patrick is Professor and Program Coordinator of Business Analytics at St Lawrence College, Kingston. Patrick is also Founder and Chief Analytics Coach at EBCHIM Innovation and Research. He brings his passion for analytics to his coaching sessions, and leverages his knowledge in delivering an exceptional experience for his clients.